These Etip Gloves from The North Face have Xstatic conductive fingercaps on the thumbs and index fingers so you’ll be able to answer your iPhone or use your capacitive-screen electronics without having to take off your gloves. There’s a grid of silicone dots on the palm, thumb, index, and middle fingers to improve your grip on your gadget. 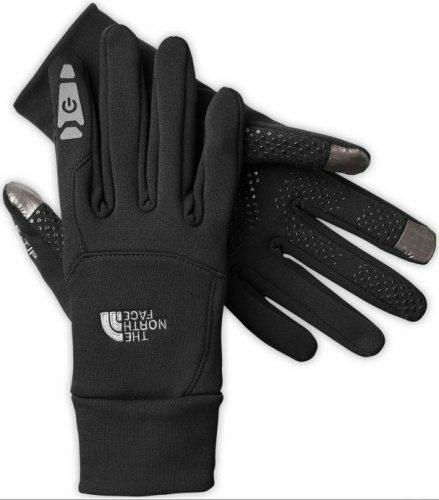 The gloves are made of a stretch knit that is warm but not designed for the most extreme conditions. Right now, the Etip gloves are available on The North Face website in black in men’s size M, L, or XL or snow white in men’s size L or XL. (Normally the size range is XS, S, M, L, XL. Also, the asphalt gray color is currently sold out.) The Etip Gloves are $40.00 at The North Face website. You can probably find them at retailers, too. These look nice, but I bought the aGloves reviewed in October that have the conductive silver throughout the fabric.